The most popular route to the summit of Mount Kilimanjaro these days is Machame route, and for good reason. This trail offers stunning views, a reasonable challenge, and plenty of time to acclimate, making it a good choice for those who have a bit of extra time in their schedule. Machame route has been nicknamed the “Whiskey Route” because it is often perceived as being tougher than Marangu route, which is often referred to as the “Coca-Cola” route. Unlike that trail however, camping is allowed on Machame, which means trekkers will be sleeping in tents all the way to the summit. Trekkers who take the Machame Route pass several well known Mount Kilimanjaro landmarks while en route, including the famed Lava Tower and Shira Plateau. The route wanders up and down a series of valleys and ridges, which make the walk a bit more strenuous, but rewards hikers with some of the best views on the mountain. It is for that reason that Machame route is widely considered to be the most scenic of all of the routes up Mount Kilimanjaro, providing unique and varied landscapes to pass through on each and every day. The trail starts on the south side of the mountain, passes underneath the Souther Ice Field and makes its summit approach from the Barafu Camp. For travelers who have a few extra days in their schedule, Machame route is an excellent option. One or two additional days of acclimatization can make a big difference in the success rate, so trekkers who choose this route reach the summit more often, despite the fact that this is a more challenging hike than Marangu route. One of the biggest and most intimidating of those challenges is the Barranco Wall, a steep cliff face that can look quite scary upon first approach. In reality, Barranco isn’t nearly as frightening or difficult as it first appears, although you will have to watch your step, and possibly use your hands for extra leverage while scrambling over certain sections. The climb usually takes about an hour to an hour and a half to complete, and the view from the top makes it worth the effort. The downside of the Machame Route is that it can get crowded at times. Because it is so scenic, and offers a few extra days to acclimate, it is a popular choice for Kilimanjaro trekkers, which can make the trail and campsites very busy, particularly during the high season. Still, if you’re looking for the quintessential Kilimanjaro experience, it is difficult to beat Machame route. The itinerary below describes the 6 nights/7 day Kilimanjaro climb via the Machame route. To shorten the below itinerary to six days you skip the night in the Karanga Valley and instead walk straight from the Barranco Huts to the Barafu Huts in one day. A short drive brings us to the Machame trailhead (~5,380’). After the climbers and crew have checked in with the park rangers, we will hike up through the montane forests, winding up the mossy jungle, making our way to Machame Hut camp. After breakfast, our hike continues through the forest. We will take our time, soaking in the scenery as we make our way through the moorlands. We will be treated to spectacular views of Kibo peak. Today is a long day but lots of acclimatization as you climb high, sleep low. We will take an acclimatization hike to Lava Tower (~15,190’) for lunch, before descending to the Barranco valley. For those who have energy, and if time and weather permit, there’s the possibility to scramble up the Lava Tower itself. The scenery is amazing today, passing through different zones of the mountain. Today you’ll continue to acclimatize and let your body adjust to these higher altitudes, in preparation for your upcoming summit push. Climb the steep Barranco Wall and then go up and down several ridges and valleys before arriving at Karanga camp. There will likely be time for an acclimatization hike in the afternoon. Today you’ll continue your circuit and arrive at your final camp before the summit (Barafu camp). Some ups and downs along ridges and valleys along the way. You’ll have an early supper, sleep for a few hours, and then arise at about 11:00 PM to start tomorrow’s summit ascent. Start hiking at around midnight, using your headlamps to lead the way slowly up to Stella Point and then the summit. Due to the altitude, you will hike slowly, and will need to dress warmly for the cold. After celebrating with photos at the summit, descend down to Mweka camp. We make the final descent through the rain forest to Mweka Gate. Here we will have lunch and say goodbye to our mountain crew before leaving Mount Kilimanjaro National Park. Drive back to Arusha for a hot shower and a celebratory dinner. The questions and answers below are specific to the Machame route. How difficult is the Machame Route? The Lemosho route is considered one of the easiest routes on Kilimanjaro as it’s longer itinerary allows for better acclimatization. However, hikers will still need to ascend the Barranco Wall and climb steeply on summit night. No technical climbing is required but a good level of fitness is higly recommended. 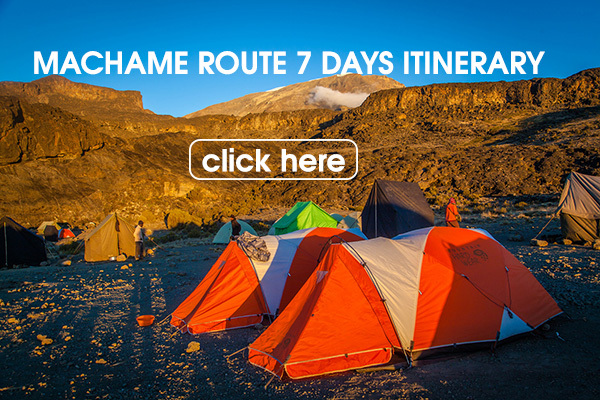 What is the distance of the Machame Route and how many days does it take? The exact trekking distance for the Machame Route is 62km or 37 miles. The shortest number of days required for Lemosho Route is 7 days, but by the time you have added on arrival and departure days it is 10. However, as it is a much longer approach route it is actually best done over 8 or 9 days to increase your changes of success. What is the Machame Route Summit Success Rate? Due to it’s climb high sleep low mechanism, summit success rates on the Machame route are very high. Whilst there are no official statistics, the average success rate across all operators is 85% for the 7 day trek and a 73% success rate for the 6 day trek. However, We have a 95% summit success rate for the Machame route. 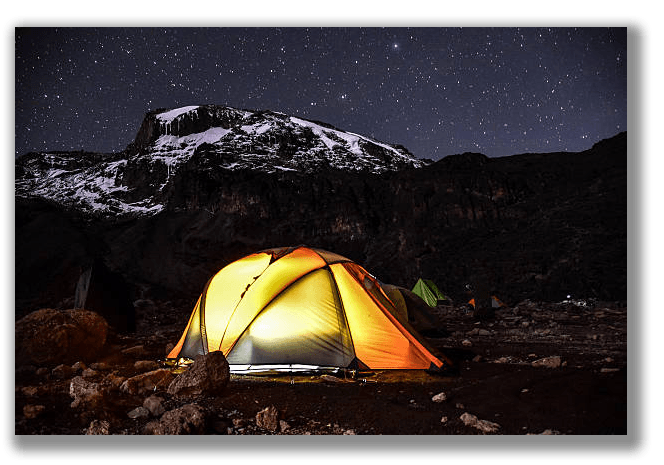 What is the Scenery like on the Machame Route? The scenery is extremely varied and you will pass through 5 climatic zones on your way to the summit. The trek begins in rainforest on the lower slopes before continuing up into the low alpine zone of wild grasslands and moorlands. From there you trek into the high alpine zone before reaching the glacial zone. You will encounter many incredible vistas and visit stunning places such as Shira Plateau, Barranco and Lava Tower. When is the best time to Trek Machame Route? July-September is the best time to climb Kilimanjaro, as the weather is most stable during this period and encountering rain is less likely. That said, since it is close to the equator it is possible to climb the mountain at any time of the year. April and May is the rainy season so this period is best avoided.